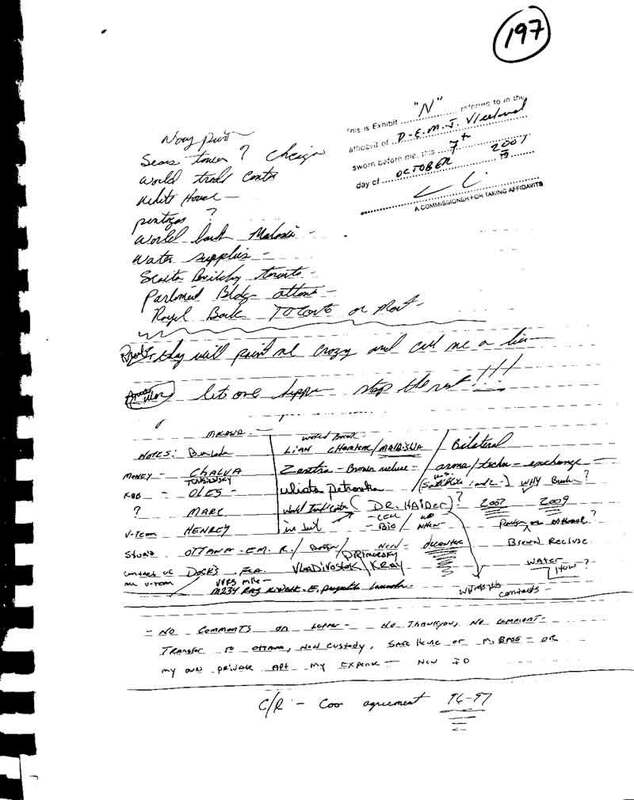 TORONTO, Feb. 29, 2002 -- A man who claims to be a US intelligence officer accurately predicted the Sept. 11 attacks on the World Trade Center and the Pentagon, recently unsealed court documents show. Delmert Edward Mike Vreeland is currently incarcerated in a Toronto prison. His claims, however, are corroborated by evidence that has surfaced during his ongoing court battle in Canada. Court hearings in late-Feb. have only deepened the mystery and added to the list of questions, calling into question the integrity of the US government. Vreeland has been subject to physical attacks while behind bars, indicating that the certain death he fears if he is returned to the US, might become a reality behind the jailhouse walls in Toronto. As America wages an increasingly expensive and complex war against terrorism, Vreeland sits in a Canadian jail with a story to tell. It is a story about the murder of a Canadian Department of Foreign Affairs and International Trade (Foreign Affairs) worker, and about foreknowledge of the horrific terrorist attacks on Sept. 11. One would assume it is a story deserving of the Canadian and US governments attention. Yet, despite Vreeland s repeated attempts to inform them, both the American and Canadian governments have oddly and inexplicably refused to listen. Their argument goes something like this: Vreeland is not perceived to be trustworthy or credible. Therefore, nothing he says can be deemed trustworthy or credible. But, they have never seen fit to ask how he knew of the attacks in the first place. Vreeland s story does indeed resemble something that John Grisham might produce in the throes of a caffeine-induced frenzy. However, Vreeland s story begins to look less like the stuff of unadulterated fiction when one takes into account actions of US and Canadian authorities that seem equally bizarre. It is becoming increasingly evident, as the case against him unfolds, that the documentation pertaining to Vreeland, supplied by the US Navy and Canadian law enforcement officials, is itself so contradictory and incomplete as to, frankly, defy logic. As such, the validity of the charges against Vreeland and the position adopted by US and Canadian authorities raise more questions than they answer. Vreeland, an American citizen who has been in jail since Dec. 6, claims he is a US Naval lieutenant who has worked for Naval intelligence since 1986. The US is seeking to extradite Vreeland on a Michigan warrant. Crown Solicitors, Canadian government lawyers in Toronto, are representing the US government in this case and have dismissed Vreeland s claims of affiliation with US intelligence as nonsense, on the grounds that he lacks credibility. Justice Archie Campbell of the Superior Court of Justice, who briefly presided over the case, is in agreement with the Crown s assessment and has described Vreeland as nothing more than a petty fraudsman with a vivid imagination. Ostensibly, Vreeland s story begins in the fall of 2000. In a sworn affidavit filed in court documents on Oct. 16, Vreeland claims that he was sent on assignment to Russia where he was in contact with Marc Bastien, a computer systems specialist working for Foreign Affairs at Canada s embassy in Moscow. Vreeland acquired information vital to the national security of the US and Canada. Vreeland alleges he left Russia with the documents, and arrived in Canada on Dec. 2, 2000. According to his affidavit, he expected to meet Bastien two days later in Toronto to hand over the documents to a third party. Bastien did not show up, however, so Vreeland hung onto the documents. Vreeland asserts that he proceeded to upload the documents onto a secure website, the location of which is unknown to anyone to the present day, including his attorneys, Paul Slansky and Rocco Galati. Vreeland claims that Bastien had given him two telephone numbers at CSIS, the Canadian intelligence service, to contact in the event that anything went wrong. He was subsequently arrested in Toronto on Dec. 6, 2000, on alleged fraud charges. At the time of his arrest Vreeland claims that he attempted to contact CSIS, per Bastien s instructions, but he was unsuccessful. Upon his arrest, Vreeland was placed in solitary confinement. The reason for this treatment was the difficulty Toronto police had in confirming his identity. FBI fingerprint records, requested by the Toronto police, were negative, indicating that Vreeland had no criminal record. After he was removed from solitary confinement on Jan. 15, 2001, he learned that six days after his arrest, on Dec. 12, 2000, Bastien was found dead. The official explanation was that he died of natural causes. Vreeland stated in his affidavit that he believed Bastien was in fact murdered, a statement which later proved correct. In May, the US government issued a formal request for the extradition of Vreeland on charges of credit card fraud. It was at this point that he hired Slansky, and later, Galati, to fight the extradition. Vreeland s first objection was that the credit card in question was his own. In addition, his criminal record shows that he was detained in New York at the time the alleged offence was committed in Michigan. Both Vreeland and his lawyers believe that the US government is pursuing extradition on minor and dubious credit card charges, when in fact the government intends to prosecute him for treason, a capital offence, in relation to the documents he retrieved from Russia. In June, Vreeland informed his counsel that he had information vital to US and Canadian national security. He did not then, nor has he since, divulged the substance of this information to his counsel. Between June and Sept., Vreeland s counsel made repeated and exhaustive requests to US and Canadian intelligence offices that they speak to their client. Their requests were ignored, except for one meeting with the Royal Canadian Mounted Police (RCMP) on Aug. 8. The RCMP contacted the US Navy and was told that Vreeland had been unsatisfactorily discharged in 1986 after four months of basic training. The position of the Navy was contradicted by an attachпїЅ at the US embassy in Ottawa, who spoke with the RCMP and confirmed that Vreeland was a lieutenant in the US Navy. The Navy refused to cooperate with the RCMP, and the attachпїЅ s statement has since been retracted. Because of this, the RCMP did not follow up on the meeting, and Vreeland was dismissed as a crank. It would seem, particularly in the wake of Sept. 11, that this was not an outlandish request. Were Vreeland to be formally debriefed he would be subjected to polygraph and psychological tests. If he is simply a nut-case with a vivid imagination and a penchant for forging government documents, then this would surely become evident fairly quickly and he would be sent back to his jail cell. In August, Vreeland wrote down information from the documents he acquired in Moscow. The information was fed to him in jail by telephone from a contact he had on the outside who had access to the secure website. It may well be a coincidence, but, a man called Abu Doha, using the alias Dr. Haider, was arrested in London in early-2001. The sworn affidavit of an FBI special agent dated July 2 indicates that Doha was suspected of conspiring to bomb various US targets, including airports. Doha was allegedly a leader of an Algerian terrorist cell operating from Afghanistan, associated with Osama bin Laden s terrorist network, al Qaeda. Coincidence or not, it certainly begs the question of how a jailed man with limited access to computers could know such an obscure detail. Meanwhile, the efforts on the part of Vreeland s counsel to defend his credibility resulted in the retrireview of his Navy personnel record. On Sept. 7, Commander Nieusma, naval liaison to the US Congress in Washington, D.C. forwarded Vreeland s attorneys 56 of 1261 pages of Vreeland s Navy personnel record. Commander Nieusma s assistant, Tim Decent, later provided Vreeland s extensive Navy medical records. These documents are available in court records. So this begs the questions, how can a man, with only four months of basic navy training, manage to accumulate a 1261-page personnel record and extensive medical records? Why are over a thousand pages are missing? Why do the pages that do exist display clear omissions and evidence of tampering? So far, plausible answers to these questions have not been addressed by the Crown, or anyone else for that matter. On Sept. 11, the US was subjected to violent attacks of an unprecedented scale. Three days after the attacks, on Sept. 14, Vreeland instructed his guards to retrieve the sealed note and open it. They did and promptly contacted Vreeland s attorneys, who were unaware of the note. One would reasonably assume, indeed expect, that the events of Sept. 11 would compel US and Canadian authorities to talk to Vreeland, but they continue, to this day, to ignore him, with only a few very tentative exceptions. Parliamentary Secretary, Lynn Meyers, granted Galati a meeting, the first of three, in Ottawa on September 20. They met again on Oct. 10 at Mr. Meyers office in Waterloo in the presence of Slansky and another unidentified individual. During this meeting Meyers confirmed that Bastien, Vreeland s alleged contact in Moscow, had indeed been murdered. Vreeland was thus vindicated on this point. The coroner s report, which suggests Bastien was poisoned, was only made public three months later, on January 21. On Oct. 15, Galati traveled again to Ottawa to meet Meyers, this time under the impression he would also meet the Solicitor General Lawrence MacAulay to voice his concerns about Vreeland s information. The Department of the Solicitor General oversees Canadian law enforcement and intelligence communities. But, when Meyers and Galati met MacAulay, he refused to grant them even fifteen minutes of his time. The next day, Vreeland s exasperated counsel filed his sworn affidavit into public record. On Oct. 22, in an effort to seek clarity regarding Vreeland s identity and the charges against him, his counsel filed a disclosure motion. This motion amounts to a request that the US government be compelled to produce official records pertaining to Vreeland, specifically his criminal record and Navy personnel record. This would seem to be a logical and reasonable request as not much about any government or law enforcement document pertaining to Vreeland makes very much sense at all. On the one hand, the Detroit News reported on April 27, 2000 that Vreeland was sought by authorities concerning a string of ID theft and fraud charges. But on the other hand, Vreeland s criminal record is inconsistent and contradictory, as is his Navy personnel record. Instead of being a reason to disbelieve Vreeland, the criminal records alleging fraud are entirely consistent with covert intelligence operations. Vreeland was allegedly allowed a per diem of $19,000, and his credit cards would likely have been underwritten by the US Navy or the CIA. As documented by the history of the Iran-Contra scandal, any number of intelligence operatives who had discretionary control of large sums of money, were routinely controlled by this method. Among the Iran-Contra era figures who fit a similar pattern were Al Martin, Steve Carr, Scott Barnes, Scott Weekly, Jack Terrell, Lt. Col James Bo Gritz, and many more. It is also significant that Vreeland had apparently never served much time for the prior charges, suggesting that his claims of intelligence connections enabled him to be released from jail quickly. Yet, on Oct. 25 Justice Campbell of the Superior Court of Justice denied the request of Vreeland s counsel to compel production of records. Campbell s decision was based on his belief that the evidentiary record, which is largely supported by conflicting documentation supplied by US and Canadian authorities paints Vreeland as a petty fraud with a vivid imagination. Galati s response was if Vreeland is the petty criminal they claim he is, his criminal record should take five minutes to produce. It would also settle the argument as to Vreeland s whereabouts at the time the alleged credit card fraud took place in Michigan. At present, records show him to be in two places at once, something surely even Vreeland is not capable of. Two attachпїЅs from the US consulate met on Oct. 24 with Vreeland s counsel at the Barristers Lounge on University Avenue in Toronto. Galati stated that the Justice Department, representing the US government, refused to host the meeting on the grounds that the department did not want to get involved. Neither the attachпїЅs nor Vreeland s counsel wanted to meet at either of their respective offices. During this meeting, Vreeland s attorneys informed the attachпїЅs that their client claimed to have information regarding threats to President Bush s daughters, Jenna and Barbara, and Prime Minister Blair s eldest son, Euan. According to Vreeland, the threats were posed by two terrorist cells -- one based in Montreal and the other in Europe. The next day, Oct. 25, Slansky was telephoned and informed that a US Secret Service agent was on his way from Buffalo to meet with Vreeland and his lawyers. The agent and Vreeland spoke alone for 30 minutes. It is interesting that on the day Vreeland was described as a petty conman by Justice Campbell, a Secret Service agent took time out of his busy schedule to interview this conman about threats to the children of the leaders of the free world. Several days later, on Oct. 29, the US counselor officer, David Abell and his assistant Ms. Kasey Flemming, met Vreeland in the presence of his counsel. Abell is the head of American Citizen Services at the US consulate in Toronto. The subject of this meeting was confidential, and no other meeting has taken place since. On Jan. 10 Vreeland s counsel took a very big risk. Slansky telephoned the Pentagon in open court. Slansky first called directory assistance in Washington. D.C., and was provided with the main number for the Pentagon. The Pentagon operator confirmed Lt. D. Vreeland s rank, room and telephone number. The Canadian lawyers called into question the reliability of the telephonic demonstration. They argued that Vreeland, who, as they claim, had no particular education or training, was able to arrange from jail to manipulate the Pentagon s computer and simply insert his information by telephone and e-mail. Galati said two days after this display in court, a clerk at the Canadian Justice Department was informed that an NCIS investigator had gone on record to say that US authorities were at a loss to explain how Vreeland had manipulated the system. Hacking into or manipulating the Pentagon s computer system is a federal offence. The telephone call to the Pentagon revealed one of two possibilities -- either Vreeland manipulated the computer system, or he is who he says he is, and it is the government who is manipulating the system. The presiding judge, Justice MacDonald, formed the opinion that it is more probable that Vreeland managed to manipulate the system. He found Vreeland to be an imaginative and manipulative person who has little regard for the truth. Although MacDonald acknowledged that the computerized records provided by US law enforcement officials regarding Vreeland s criminal convictions are terse, incomplete and confusing, he rejected the request made by Vreeland s counsel that their client s asylum claim be permitted to proceed on constitutional grounds. In other words, MacDonald s decision was based on a subjective assessment of degrees of probability, rather than proven fact. Galati, who intends to appeal the decision, said that Macdonald s judgment suspends reality and brings judicial proceedings into the realm of Alice in Wonderland. The latest round of court appearances, presided over by Justice Laforme, began on Feb. 18. Slansky argued that as the Canadian government s position attacks the credibility of his client, then it is only fair that he be given the opportunity to defend his client s credibility. As Vreeland s counsel has been denied access to their client s certified criminal record and the missing pages from his Navy personnel record, they have opted for the next best thing -- witnesses. Slansky requested that he be permitted to summon witnesses during the extradition hearing that could corroborate Vreeland s story. Among the witnesses they seek to question are individuals familiar with Pentagon computer security and personnel records, as well as Commander Nieusma, who forwarded Vreeland s inconsistent Navy personnel record. The judge s decision on this matter is still pending. In an unsettling turn of events, Slansky alerted Justice Laforme that Vreeland was allegedly physically assaulted and threatened by a prison guard on the evening of Feb. 18, and again the following morning. Vreeland has pressed charges, and Laforme ordered that the guard in question was to have no contact with Vreeland pending an investigation into the allegations. Vreeland has a history serving as an informant against organized crime interests in Michigan. This history may offer a possible explanation for the recent assaults. In future stories FTW will explore Vreeland s relationship with organized crime and the long history of the relationship between organized crime and the CIA. Whatever the precise nature of Vreeland s identity and criminal history is, it should be largely irrelevant if he has information that could help the government with its investigation of the Sept. 11 attacks. The FBI does not subject informants or individuals who call with tips to stringent evaluation. In many cases they do not even require an informant s name. So why is the personal credibility of a man who has been right about the murder of a Foreign Affairs worker, and who had foreknowledge of the September 11 attacks an issue? Mike Vreeland s story raises the question of why the US and Canada insist on ignoring such an obvious investigative lead. If no stone is to be left unturned, why is Vreeland s Rock of Gibraltar being left alone?